ANDY MCMILLIN CONQUERS THE SCORE BAJA 500 AFTER QUALIFYING IN FIFTH PLACE ANDY MCMILLIN NAVIGATES A BRUTAL COURSE TO WIN HIS SECOND SCORE BAJA 500 VICTORYBy Dan Sanchez Photos by Get Some Photo A grueling course and flat rear tire weren’t enough to keep Andy McMillin from earning his second overall SCORE Baja 500 victory. As one of the most prestigious races in all off-road motorsports, the SCORE Baja 500 is one of the toughest races that can easily end a team’s day at any point during the race. Nobody knows this more than Andy McMillin and the McMillin family, who have come out to Baja and competed here for more than 40 years. McMillin won the race in 2010, but a second win eluded the 30-year old driver until he was the first to cross the finish line in this race. “This win was very different than the 2010 win,” said McMillin. “The pace you need to run today to win this race is 20 to 25 percent greater. Back in 2010, there weren’t as many drivers and trucks being so close to each other. For example, halfway through the course in 2010, there were about three lead Trophy Trucks that were within five minutes of each other. At this year’s race, there were six to seven trucks within two minutes of each other.” This year’s SCORE Baja 500 took competitors across a wide range of terrain that again tested the limits of the vehicles and drivers. “The hardest part of the race was the distance and the different types of terrain,” said McMillin about the 513.67-mile course that started and ended in Ensenada. “It was really gnarly. Getting over to the beach it was mountainous and rocky. The truck drives differently in various types of terrain so adjusting your driving skills is tough. We had one flat tire in San Felipe, puncturing a rear right tire. 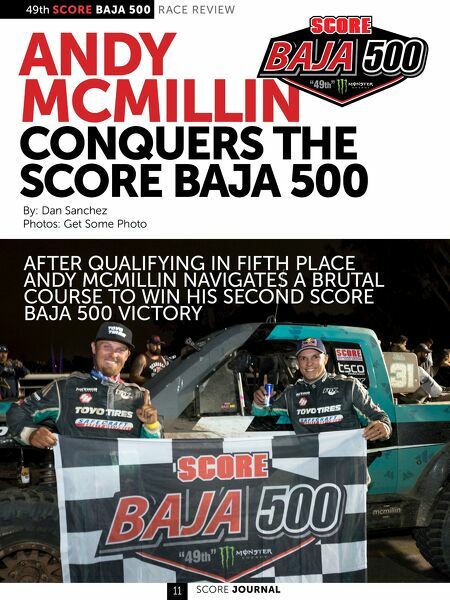 Luckily we had a pit a couple of miles up and we nursed it in.” Qualifying For A Good Starting Position To win the SCORE Baja 500, it took McMillin and the other SCORE Trophy Truck teams weeks of preparation and pre-running the course. With SCORE’s implementation of a Qualifying Round for the Trophy Truck, Class 1, and Trophy Truck Spec classes, it adds another level of competition to earn a good starting spot which can give an advantage towards winning a long-distance race like the SCORE Baja 500. Qualifying took place two days before the race, June 1st, near Urapan, an area about 24-miles south of the race’s start and its finish line in Ensenada. Competitors took on the 2.98-mile course, where the fastest time earned the top starting line positions for the race. Within the Trophy Truck division, the team of Aaron, Alan, and Rodrigo Ampudia got the number one starting position for the SCORE Baja 500, with a time of 36.8 seconds across the course, and an average speed of 49.48 miles per hour. With Alan Ampudia behind the wheel, it was his second time on a qualifying run, and he managed to pull out all the stops to get the top starting position. “I couldn’t believe I was even in the top five,” said Ampudia. “The track was a little rough and the field was really stacked, so it was very hard. Rodrigo was riding with me and he’s a more experienced driver, but he gave me really good advice which paid off.” Not far behind within the field of 37 Trophy Trucks was BJ Baldwin, who ran only 20 seconds behind the Ampudia team, making him a top contender to win the race. “I like the qualifying loop a lot, and this particular loop caters to my driving style,” said Baldwin. “I always want to win qualifying but the best starting position is probably fifth or third--maybe. I love the SCORE Baja 500 and the Baja 500 loves me. I’ve always done pretty well here as long as everything stays together. I think I’ve been second here four times and I won it in 2008. It has been a good race for me.” The rest of the top five starting field of Trophy Trucks was followed by Bryce Menzies who qualified in the third position in front of Tracy Graf out of Las Vegas, Nevada. Andy McMillin started fifth off the line for the race, which put him with the top of the leaders and well in front of tough competitors such as Robby Gordon, Apdaly Lopez, and Mark Post. 2017 SCORE San Felipe winner Rob MacCachren ended up starting in the eleventh position, while last year’s SCORE Baja 500 winner Gustavo ‘Tavo’ Vildosola started in 15th position. Within the Class 1 qualifying heat, Mike Malloy, out of Murrieta, California finished fast enough to lead the class off the starting line. He was followed by Rob Archibald, Morgan Langley, and Matt Cullen. The father and team of Brian and Brad Wilson followed Cullen in fifth and sixth starting positions. The third SCORE Class to compete in the top qualifier would be the Trophy Truck Spec vehicles. With tough competition and a growing list of competitors moving into the division, it was essential for these racers to get a good starting line position. Ultimately, it was John Langley who earned the fastest time and the first starting position among the Trophy Truck Spec competitors. Langley was followed by Pete Sohren, Andre Meyers, and Jonathan Brenthel. 2016 Trophy Truck Spec champion Chad Broughton rounded out the top five qualifiers with Elias Hanna finishing in sixth place. RIDE ALONG WITH ROBBY GORDON AS HE QUALIFIES FOR THE SCORE BAJA 500 Anticipation Before The Start With cooler than normal temperatures hanging over Ensenada, there was a lot of anticipation for the beginning of the 49th SCORE Baja 500. The city of Ensenada and its mayor, Marco Antonio Novelo Osuna, were gracious hosts for the race, along with popular restaurants, hotels and area attractions that gave visitors to the city a full experience of the area’s culture and cuisine. While race teams and visitors enjoyed the best of Ensenada, the anticipation for the race festivities began with Contingency Day that took place in the center of town the day before the race start. From 9 am to 5 pm the Boulevard Costero, in front of the Riviera del Pacifico Cultural Center, was the spot where teams, vehicles, and fans got together for a huge pre-race celebration. Thousands walked down Contingency row to shake hands and take photos with racers while enjoying great street food and music. Later that evening, the crowds made it over to Papas And Beer for the Monster Energy Papas Y Beer SCORE Street Party. It was here that the pre-race celebration carried over through the night, with fans excited for the beginning of the race the following morning. Culture And History Meet At The SCORE Starting Line Race day began early at the SCORE Baja 500, with Pro motorcycle racers heading off well before the sunrise. Those spectators willing to brave the cold and the early morning were able to see fan favorites such as Mark Samuels and the 1x team leave the starting line. A total of eight Pro Moto Unlimited teams made their start in Ensenada, while three solo riders would fight the Baja terrain to try and win the Ironman division. By 9:00 am, the large crowds gathered at the starting line to see the SCORE Trophy Truck division roar onto the course. Fans were treated to ballet folkloric dancers and watch the Mexican Honor Guard salute both the Mexican and United States flags. SCORE had a live stream of the event, in which thousands of people from across the globe, could log onto the SCORE International website and watch the event as it unfolded. SCORE announcers Rat Sult and Donovan White, emceed at the starting line, talking to racers before they headed off to the Baja race course and described what kind of conditions the racers would expect throughout the day. Prior to the start of the SCORE Trophy Trucks, the grand marshals Ivan “Iron Man” Stewart and pro wrestler Rey Mysterio were introduced to the crowd. As the Trophy Trucks lined up to the starting line, Ivan Stewart gave racers a thumbs up, while Rey Mysterio raised the green flag to send the racers on their way to another SCORE Baja 500 adventure. Trophy Trucks Battle On A Tough Course As the rest of the four-wheel classes made their way to the starting line, the battle for the lead was well under way for the Trophy Truck division. Aaron and Alan Ampudia, who were first off the line were well under way on their first full SCORE Baja 500 race in a new Trophy Truck but was quickly caught by BJ Baldwin. At some distance after Mike’s Sky Ranch, Baldwin ended up rolling over, ending his day. While the incident may have seemed lucky for the Ampudias’ their day also ended shortly afterward when they lost the engine at mile 95. This put Bryce Menzies, Tracy Graf, and Andy McMillin into the top three positions. From further back in the field of Trophy Trucks, Justin Matney, who started 13th, and Rob MacCachren who started 19th, had worked their way up to the leaders and looked for opportunities to take the lead.Baja always has a change of plans, however, as problems continued to plague the leaders once again. One of them was Menzies, who was out of the race around mile 220. This left Andy McMillin in first place after passing Graf along the course. Earlier in the race, McMillin came up on a rise and realized he was at a Virtual Check Point (VCP). “I came up over a rise and a cattle guard and was coming in fast to put some time between me and anyone behind me for a scheduled pit that was about a mile or two up ahead,” said McMillin. “When I came over the blind rise I saw the VCP and realized I blew through it, expecting it to be about a quarter-mile further up the road. That really shook me as I thought I had just lost the race but was sure that in pre-running, and on our GPS, the checkpoint was supposed to be farther up the road.” Fortunately, McMillin wasn’t penalized, but his troubles weren’t over yet, getting a flat tire around mile 353. He took a chance, deciding to ride on it until he reached his pit crew two miles ahead on the course. “It’s always a gamble as the tire could come apart hitting a rock or other obstacle,” said McMillin. “It paid off as we were able to change it quickly and stay in first place.” McMillin managed to hold onto the lead and win the overall race and the SCORE Trophy Truck division. “This was a very special win,” said McMillin. “This is the first win since 2011, with my own truck and my own team. The TSCO truck ran great and the team is great. We ended up having great pit support and a good strategy that paid off in the end.” Justin Matney managed to hold back Rob MacCachren to come in second overall. “It was a rough course out there but the truck ran great so I don’t have any complaints,” said Matney. While it was no surprise that MacCachren could manage to move up towards the pack, the course started well behind the Trophy Truck pack, his skills and experience kept him in the race to finish in third place. “When we got to mile 80 there were two or three trucks in front of me but in front of them was an eight-minute gap to the rest of the guys,” said MacCachren. “We passed Luke McMillin while he was fueling near El Coyote, and were trying to make time and stay with Apdaly Lopez and ended up clipping a rock. Wayne got out and changed the flat pretty quickly but three trucks got by us. When we got down to San Felipe we passed Dan McMillin going across Diablo and we just hammered down the whole loop and made up a lot of time. We were probably eight to nine minutes down to Andy then and just on that loop we picked it all back up.” In all, the 49th SCORE Baja 500 was a brutal course. Of the 233 total competitors, less than half, 149 in total, crossed the finish line. The distance was also a factor for many racers, and considering the amount of time it took the fastest of Trophy Trucks to cover the 513 plus miles, they crossed the finish line in Ensenada in the dark. Despite the challenges, however, the various class winners deserve their moment in history and the accomplishment of finishing and surviving one of the toughest races in off-road motorsports.